Shopping. We all do it. Clothes shopping, food shopping, present shopping… the list goes on. For centuries shopping has involved visiting a store, picking out your items, exchanging these items for currency of some sort and leaving with said items. The act of shopping was then revolutionised in the 1990s when it first became possible to shop online. Amazon appeared in 1995 and then a year later, hello eBay. But is online shopping all it’s cracked up to be? Or has it done us more harm than good? It is only too easy to be lured in by offers and discount codes. All reason goes out of the window. They want me to pay £5 for postage? Ludicrous! But look here… spend an extra X amount of pounds and get free shipping… bargain! I’m guilty of falling victim to stupid things like this. But the way I look at it, if I paid for postage, I’d never see that money again. However if I spend an extra £20 on something I’m unsure of, I can at least return it for free and get my money back. It makes sense. At the moment, online January sales are a big danger for purses everywhere. This is the time of year when you find something a bit ugly – yet oddly intriguing – and think “hey, it’s in the sale and it’s only £5. Who cares?” And despite the sales, I will still end up buying non-sale items. In fact most of my basket is suddenly full of non-sale stock. How did that happen? Boo. It really is. In fact it can be compared to the addictiveness of gambling. You see all these bingo adverts announcing “only £10 to play – and get a free £20 from us on top of that as a thank you”. And it is exactly the same with online sites. Spend £75 and get free shipping. Spend over X amount and get X percent off. They encourage you to spend more and more. Shopping online can even become a little bit of an obsession for some of us. You find something you like but they don’t have your size. I’ll check again tomorrow you say. But you don’t just mean tomorrow. You check back every single day. And several times each day may I add? One bonus of online shopping is that if it’s tipping it down outside, you don’t have to go out. You don’t even have to get dressed. Order naked if you like. No one cares. No one can see you. Bloody brilliant. But let’s face it, it is a little bit lazy. No physical activity whatsoever is needed other than some wrist action (for the mouse) and finger motion (typing). It is obviously a lot healthier to go out shopping and get the exercise… but staying home is just more convenient. You don’t have to lug all those heavy bags back home. Instead you have lovely Mr delivery man (or woman as the case may be) to do that for you. You can add many things to your basket – it can’t hurt right? You don’t have to buy it all. Decisions can be made later after all. When you’ve had your fix and finally decide to view your basket, you faint momentarily over the total it’s reached. How did it get to three figures?! The “removing from basket” stage is a painful one. It’s like giving up one of your children. The whole process is just way too easy. There are even options to save your card details for “next time”. And it never feels like you’re spending money. It doesn’t feel real. Yes, online shopping has its annoyances but it also has its good points. It can be quite an enjoyable experience. You can put your feet up and sit comfortably with a nice cup of tea. You don’t get all hot and sweaty like you do racing around the shops. And my favourite bit? No queues! You don’t have to get up ridiculously early to avoid the queues as these sites operate 24-7. How do you prefer to shop? Online or in-store? And me? I can’t decide. I shop online more but that’s just a convenience thing. Plus some of my favourite brands are only available online. I think that when you physically go shopping, you feel more satisfied walking out of a store with a pretty bag. The bag itself is the statement. You are saying I have been shopping. And everything within this bag now belongs to me. There is also the mystery of what is inside your bag. No one else knows but you. I often wonder what others have bought. By shopping in-store you have handed over your card / cash at the till. You physically have your goods straight away – no waiting involved. It feels more real. For the last month or so my biggest obstacle from hitting the shops has been the snow. Hence I have done most of my shopping online. Here’s a little taster of some of the things I’ve ordered lately. Enjoy! I saw Ellie Goulding on TV wearing this blouse and I fell in love with it. I don't think that the Topshop website does it justice - the detail is so much more incredible in reality. My only disappointment is that it's quite see through so I'll need to pick up a vest to go under it. 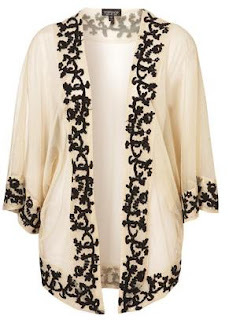 I love kimonos and bed jackets. Nicole Ritchie's Winter Kate range does some lovely ones but sadly, they're a bit out of my budget! This one from Topshop is so airy and comfortable. Again, it is a little see through for my liking (it doesn't look transparent online) but it looks lovely with a lacy black camisole. 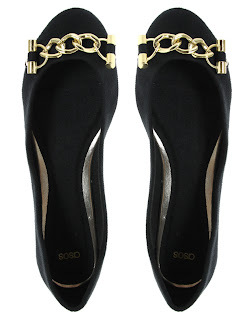 I got these in the ASOS sale and they were an absolute bargain! Words cannot describe how lovely they feel - the outer material is so soft, I can't stop stroking it! I love photography and my dream is to get a DSLR one day. I have been lusting over camera necklaces for ages now but I find a lot of them are too "big" and poorly made. 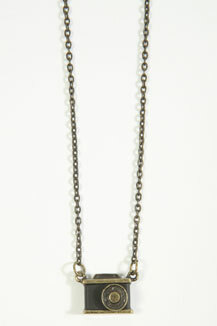 This necklace from Urban Outfitters is small and dainty - perfect! These cut out trousers really caught my eye. And they must have caught many other peoples' eyes too as they're now completely sold out!! A steal at £10 in the Office sale! They arrived today and I have never had flats like them before. 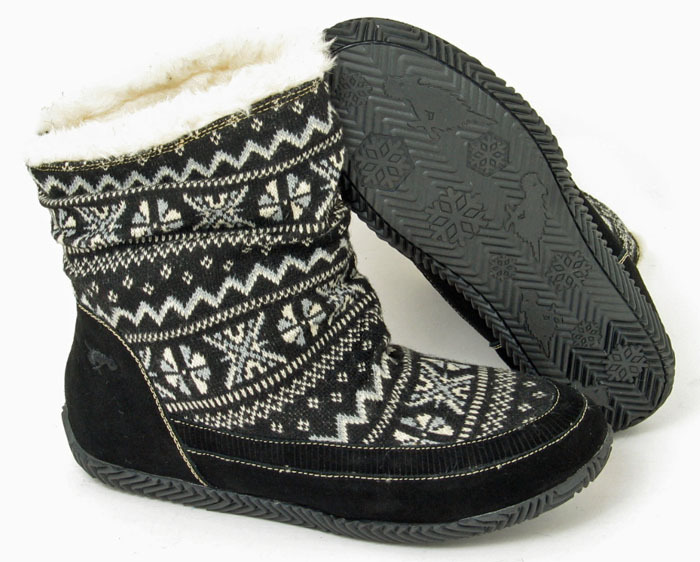 The insides are very cushioned and padded - walking in them is such a delight! I am a fairisle / nordic / alpine (whatever you call it) fanatic. And I really struggle whenever it snows. I salute those of you who go out in heels! These looked so comfortable with the fleecy insides and they have a good grip on the soles. I hope I can rely on them if it snows again! + you dont know what the things look like on you, and again.. you would have to send them back! This is seriously such a great post! I love the thought of online shopping . . . it is so convenient, but also so so tempting! But I really prefer to shop in the actual store because I can actually feel and try on the items I may want to purchase, and from this I can make a smarter decision on whether or not I should actually buy the item. I rarely buy online, but I love to just browse! I don't like shopping online. I love the thrill and excitement of looking at the window displays, and going through the cloths to finally find that thing I am looking for. Then at the end I get to show off all my bags. i love shopping online! Its so easy! I like shopping online for items you don't need to see or try on like DVDs, games, jewellery and I do my food shopping online, but I prefer to do clothes shopping in-store as I like to try things on. i love shooping online because prices are lower and variety is way bigger ! Haha I read it all, like the way you write! I like your blog a lot and I will follow you from now on :) I would love it if you would follow me too on bloglovin / google friend connect. i usually like in-store shopping because i want my things NOW. but i do shop online for things which i can't find here...and i will shop online with free shipping! Oh I couldn't choose, I like walking around the shops to have a snoop at what each store is doing, but I just love the convenience of online shopping. It really comes into it's own at busy periods like the run up to Christmas - I hate the crowds! Vintage shopping is almost always better in person though. Actually i kind of despice shopping.. Its crowded, warm and i dont have enought arms to hold everything. So i def prefer online shopping!